All of our fees and pricing structures are completely transparent so you will always know what you can expect to pay for our services in advance of putting us to work for you. TLC fees and pricing vary based on the extent and type of services and care required. We represent a wide range of household professionals ranging from enthusiastic entry level sitters to seasoned professionals. Our agency fees enable us to provide reliable caregivers and responsive service for families. • Clients compensate the caregiver directly in full at the end of each daily/weekly assignment. • Associated TLC fees are billed separately to client’s credit card upon confirmation of sitter. • Clients may use TLC as a Member or as a Visitor. Membership fee: $100.00 (annual renewal: $55.00). • 4 Hour minimum for sitting. (7 hour minimum for overnights). • Valet/Parking costs are paid by Client to Caregiver. • $10 surcharge for sick care, same day requests, and requests made after 5:00 P.M. the evening before care. Clients who wish to have caregiver compensated by TLC directly can make arrangements with the TLC office. The client's credit card will be charged the agency set-up fee following a confirmation call/email to the client for the visit. This fee covers the agency's work in setting up the visit. It is not refundable. 24 hours notice is required for caregiver cancellation or client will be responsible for paying the caregiver fee (4-hour minimum). Clients who chose to have TLC pay the caregivers will be charged the caregiver fee (4-hour minimum) plus a $10 processing fee. This service is for families who wish to hire nannies and senior helpers on a full-time or part-time basis for a minimum of one year or longer, at least 20 hours per week (15 hours per week for After-school positions). 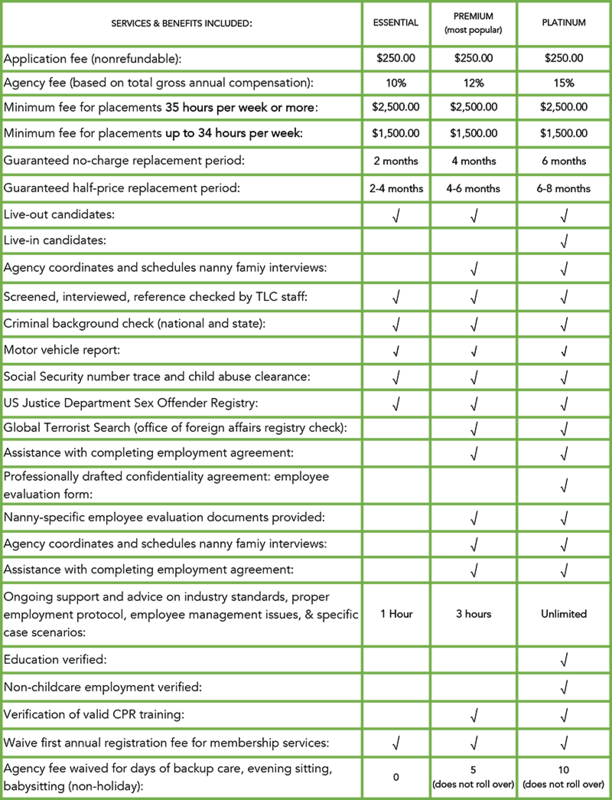 TLC will recruit, interview, and screen candidates based on the requirements determined by the family. TLC will identify the best possible fit for client interviews. There is a $250 application fee to begin the search. Placement fees are based on a percentage of annual salary and payable at the time of placement. Average salaries range between $600 and $1200 per week for full-time (35 plus hours per week) and $14-$25 per hour for part-time. Caregiver background, experience, duties, requirements, and location determine salary and hourly rates. TLC will be able to offer you a suggested range based on your job description. Long term employees are typically offered two weeks paid vacation, a fixed number of paid days for sick and personal time, and pay for six major holidays. Long term is a 52 week per year commitment. * Summer Nanny Placements $250 application fee, $550 placement fee, 2 week guarantee replacement period.